Don’t Fall for Poison Ivy’s Trap! Don’t Fall for Poison Ivy’s Trap! Don’t Fall for a Poison Ivy Trap! Poison ivy tops the list of plants to avoid because it contains urushiol, an oily resin that causes itching, burning skin eruptions. From changing leaves to the cooling temperatures, autumn is perfect time enjoy the gorgeous show that nature is putting on outside. But beware what you touch as you take advantage of the last few hours of evening sunlight – fall brings an increased exposure to poison ivy along with the leaf piles and stunning colors. Poison ivy tops the list of plants to avoid because it contains urushiol, an oily resin that binds to the skin on contact and may result in a hypersensitivity reaction characterized by itching, burning skin eruptions. 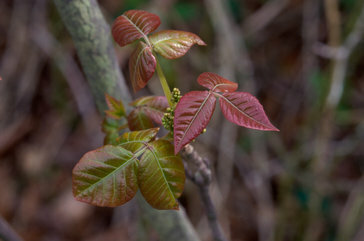 This rash-causing poison ivy sap is a clear liquid found in the plant’s leaves and the roots, which many people develop an allergy to over time. Urushiol oil remains active for several years, so handling even dead leaves or vines can cause a reaction. The oil can also be transferred from the plant to clothes, garden tools, and even pets. Avoiding contact with the plant is, of course, the best prevention. If you spot poison ivy in your yard, consult with a professional landscaper for removal. Never try to remove poison ivy yourself – the root system of the plant is difficult to remove, and “weed whacking” the plant will simply spray the poison ivy—and hence the oil—right at you. In most places poison ivy grows, you will also find a plant called jewelweed growing close by—especially in moist, shady areas. Jewelweed has been used for centuries to treat poison ivy rashes, as it seems to be a natural remedy. When you are in the field and may have been exposed to poison ivy, pick jewelweed, slice the stem, and rub its juice on your skin to ease irritation and help prevent a breakout. If you’re looking for assistance with poison ivy or have any other fall lawn care questions, then contact the Atlantic Maintenance Group. The Atlantic Maintenance Group is a full service landscaping company, providing maintenance, design and construction, as well as snow removal, asphalt and concrete services. We are your source for complete landscape and facility maintenance for commercial and residential properties throughout Maryland, Virginia, Pennsylvania and Delaware. We are a self-performing landscaping company, meaning we don’t hire subcontractors, and senior management is involved with every project. Our highly trained team of professionals receives constant, ongoing education on the latest industry trends, updates and safety measures. This ensures we can deliver outstanding customer service and results to our clients, regardless of the size of your job. If you have any questions about outdoor lighting, or to get your free quote today, give us a call at 410-768-4720 or contact us via our website today. This entry was posted on Friday, September 11th, 2015	at 4:04 pm	and is filed under Blog, Lawn Tips	. You can follow any responses to this entry through the RSS 2.0	feed. Both comments and pings are currently closed.